Updated: March 22, 2019, 3:52 p.m.
After graduating high school, Brandon Reece remembers his grandfather, Albert Griffin, telling him to get a good job so he didn’t have to come back to the grueling work on the family farm. Like any good grandson, valuing the advice of a man with much more life experience, Reece obliged. But a few years later, Reece ended up right back where he had spent his entire life — on the family farm — taking care of what was now his. The life Reece, 36, lives on the pullet and cattle farm and the only life he’s truly ever known earned him the title of Farmer of the Year at the 2019 Agribusiness Award ceremony. The award is given to a farmer in the area each year to increase the recognition and work of local farmers. As a pullet farmer, he raises chicks into egg-laying hens, which he then sells to egg farmers. Reece earned the award in part because of the way he gives back. Reece never planned on doing what he does now. He didn’t think about coming back to the family farm off Holly Springs Road in Gillsville. He took his grandfather’s advice seriously and went to work on a bridge-building crew at the Georgia Department of Transportation after high school. But when his father, Freddie Reece, was diagnosed with cancer in 2008, Reece didn’t hesitate returning to the farm. His father said they could sell the property, but Reece didn’t want everything the family had built and worked for over the generations to disappear. So, even though he didn’t have nearly the amount of experience his great grandfather, grandfather or father had in farming, he took on the job. His father still couldn’t let the job go. Even from the hospital bed, where Freddie Reece couldn’t move because of his multiple myeloma diagnosis, he looked after his son. Along with the help from friends, family and neighbors, Reece discovered a knack for farming. “It was bred into me, I guess,” he said. There is no getting done during the day,” Reece said. “You just find a stopping point and start over tomorrow. “As a kid, early on, I was learning more than I realized,” Reece said. The main income on the farm has long been pullets and cattle. 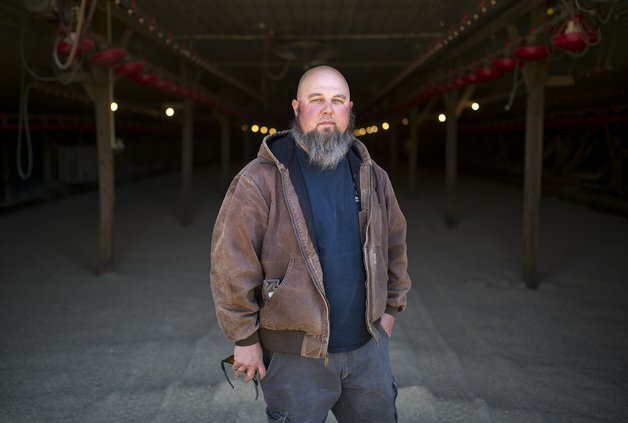 Between Reece and his father, who survived the cancer and still does as much work on the farm as his body allows, the family has nine chicken houses. The pullets come to the farm when they’re just a day old, and the Reeces raise them until they’re 21 weeks old. After that, they’re taken to another farm, where they’ll start laying eggs. They also raise cattle for beef. At any given time, there are around 120 cows on the property. “And we do hay in the hay season, and anything else we can make a living off of on the farm,” Reece said. His morning starts around 5:30 a.m., when he goes out to feed pullets, every day of the week. He makes sure they have enough water and walks through the houses to make sure everything is working and running properly. Then he feeds the cows and checks fences, bails hay during the season, every now and then checking on the pullets. “It's something they say you've got to love,” Reece said. He answers all their questions, many of them the same kinds of questions he asked when he was young. He does it so the students develop an appreciation for farming and the people who do it. And when he’s answered their questions, he heads back to the farm — where he feels most at home. But even at home, the work never stops. And just like his father, Reece doesn’t plan on letting anything stop him or the farm his family has built.